During the summer semester, the Wildcat Weekly will be on a limited publishing schedule. It will be available next week and then will be emailed out once a month - June 6, July 11 and August 8 - until the start of the fall semester, when it will resume on August 22. Please continue to submit announcements and news items for the Wildcat Weekly via the Project Requests tab on the Marketing & Communications webpage. To the spring and summer graduates of the Polytechnic Campus: congratulations! You are almost a K-State alumnus, but first, here are a few instructions and reminders for your big day - Saturday, May 6 at 10 a.m. in the SLC. Commencement rehearsal: If you plan on walking in the graduation ceremony on Saturday, May 6, you need to be at rehearsal the day prior. Graduates, please meet in the Student Life Center at 1 p.m. on May 5 for rehearsal, which will go over lining up for the ceremony, the degree conferring and receiving process and any additional questions you may have. Commencement arrival time: Graduate should arrive on campus no later than 9:15 a.m. on May 6 with your cap, gown and tassel. The student meeting location is in the College Center conference room. When you arrive, there will be a table with your reader card - the only way to know you have arrived is if you have your card. Official transcripts: If you have not ordered official transcripts for when your degree is posted, do so before the end of finals week. The last day to order transcripts at no charge is May 26; after that date, they are $15 each. When you order your transcript(s), there is an option to select "Hold for Degree." These will be processed mid-June when degrees are posted. Online viewing options: If you have family that is unable to attend commencement, share this link that offers a live feed of the ceremony with them: http://www.k-state.edu/graduation/spring2017/tech-aviation.html. Also, K-State Polytechnic's social media pages - Facebook, Twitter and Instagram - will cover the ceremony with fun photos and videos. Snapchat: A special Snapchat filter has been created for the Polytechnic Campus' commencement ceremony. It is only available from 9 a.m. to noon on May 6, so be sure to snap a lot of photos and share them across your social media platforms using the hashtag #KStateGraduation. 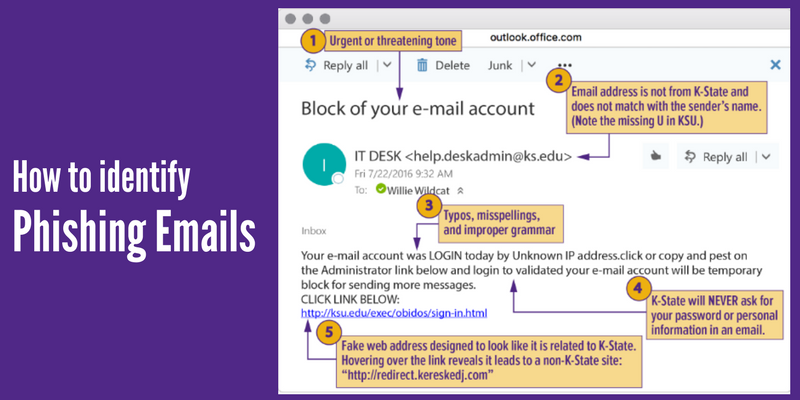 Information technology services, or ITS, is reporting an increase in university email scams over the last week. There have been 190 scams reported since Sunday, resulting in 75 compromised accounts. ITS encourages users to be especially suspicious of emails in the junk folder. Normally, emails in the junk folder are there for a reason. Last week, individuals were pulling emails out of their junk folders and responding to scams. The Undergraduate Research Showcase, which was held April 25, highlighted a variety of end-of-the-year research projects and allowed students to display and present their hard work. The projects also were judged by faculty and the top three winners received scholarships. First place was presented to Ryan Fabac, a student in computer systems technology. His project was titled "Automative Data Acquisition System". Second place winners were Logan Gideon and Tate Neill, both students in computer systems technology. Their project was titled "Print Shop Management System." Third place winner, Jason Nowak, also in computer systems technology, presented "Linux System Administration in an Enterprise Environment." Congratulations to all who participated in this year's showcase. The six members of the Polytechnic Campus retiring this year have a combined 125 years of service. On April 27, those retirees - Raylene Alexander, Bill Chestnut, Jimmy Splichal, Linda Pfaff, Linda German and Larry Huninghake - were honored during a reception and the annual "Last Lecture" presentation. As one of the retirees, Splichal was selected to give the "Last Lecture," and spoke about his life and career over the years and what he has learned. He also had advice for students, telling them to discover their "why" - explore why you want to do something - and then remember to stick to it. Splichal also joked that his other piece of advice to students is, "Don't drink and drive, buckle up and if you get in trouble, don't call me!" Congratulations to the 2016-2017 retirees and thank you for your dedication and purple pride! Congratulations to Madelyn Gonzalez for your leadership opportunity with Upward Bound! I would like to send a big high-five to Madelyn Gonzalez, who recently was hired by Upward Bound as a residence hall mentor for the Summer Institute 2017. Gonzalez is a sophomore from Chicago studying in the engineering technology program, and aspires to one day focus on aerospace engineering. Madelyn is a first-generation student, is the current president of the Solar Boat Club and is a volunteer with Big Brothers Big Sisters of Salina. Congratulations Madelyn! Upward Bound is a federally funded campus-based TRIO program designed to assist area students in successfully completing high school and preparing them for college through advisement and encouragement. Upward Bound services 55 students from ninth through twelfth grade. The criteria to be a participant in the Upward Bound program is as follows: first-generation, income eligible, and/or at-risk academically.